Ultimax Pads are a direct replacemnet for OE standard pads. These pads have a centre line slot to prevent cracking and noise under braking. The Ultimax pads are compliant with ECE R90 brake safety regulations so you know you will be getting quality replacement brake pads. Due to the heat range capabilities of the Ultimax pads brake disc life is extended so why spend more if all you need is a quality replacement pad? 1 review for this product. Jim fowler I have a vw trike . The back brakes have for the last two years been poor, i have replaced every thing still not good . I bought E B C brakes and can't believe the difference. I will never use anything else in the future. Anonymous Fitted Yellow stuff front & rear to a 2014 V60 D6, just felt the stock brakes didn't seem to stop as effective as I liked, changed from Volvo pads that had only been fitted for 25k, noticeable difference to brakes, unexpected but in traffic brakes seem to stop the car nicer, the stock ones seemed more snatchy when crawling, these seem to just work better. Noticeable improvement when heavy braking, have driven around 800 miles, not really a fast driver but can tell the difference if you need to stop quickly they are a lot better! Went for the yellow stuff due to the weight of the car, car will probably never go on a track but just having it stop that bit better gives greater confidence when on the road! Will easily recommend these and will probably replace them in the future when they wear out. John Worth DP32277C - 2018 Audi RS4 B9 front pads. Have used Redstuffs in a fast road car before , fabulous performance, great initial bite and then solid, progress retardation - can't beat them and of course greatly reduced dust and minimal disc wear - so not a lot to dislike. Andrew McLeod So, after the great results with the EBC Turbo Groove Discs and Yellow stuff pads on my Mini Cooper S, I thought I would try out their brake lines. I had them fitted all round when my garage changed the brake fluid. I now have a firmer pedal feel and more confidence in the cars overall braking ability. Very pleased. Roberto I bought this kit for my mazda. The quality is high. Delivered in few days. I definetly will recommend this shop to my friends. Good job! ON4ILL Already my 4th or 5th set of green stuff under the Omega in many thoisands of kilometers driven. Best upgrade on the cars mechanics. They Brake well in every circumstance and when warmed up they Bite. James I got these for my Isuzu dmax and was pleased with the price as they are cheaper than originals but an upgrade aswell ! Deliverd next day. No hassle. Andrew McLeod Bought this kit for the front end of my R56 Mini Cooper S after I found the standard brakes faded after high speed runs. Brake fade is now a thing of the past and overall braking performance is much improved. I was so impressed, I've just bought the same kit for the rear end. Excellent products with great advice and service. Jon excellent service. Brakes are now super smooth and excellent fade resistance, would never buy from anywhere else now I have found these guys and these products. Pierre G. Full set installed on my TT RS mk2 stg1. Very correct grip when starting cold. Very good grip when tepid, same after 3 kilometers of severe road driving (something like 80% rallye max speed - turning road - late braking to abs). Will test more intensively next month in my French mountains. Dusty pads not a problem for me. Very little noise from time to time when parking back the car. Honda Best brakes ever Recommended for everyone. Philip McDonald I own a BMW 1 Series 116D and was not at all impressed with the braking performance, most especially the way that both front wheels became totally covered in black dust within next to no distance after washing them. So I did some on-line research which included amongst others, the BMW Owners Club, Honest John, Facebook etc. and came to the conclusion that I ought to try some Greenstuff brake pads. To say the very least I was absolutely overwhelmed by EBC's levels of customer service from the start right through to the end of my transaction. The only problem experienced was EBC's choice of delivery company DHL as their services don't come within a second hand country mile of the courier DPD who are able to give you an exact delivery time. DHL on the other hand expect you to sit around all day long waiting for the package to arrive!! As for the pads themselves, WOW what a transformation in braking performance, now my foot has to only barely kiss the brake pedal before an instant and totally reassuring level of retardation is experienced. And what is more, these amazing pads are made in the UK !!! Lew First class service. Front brake kit for my Corvette C5 Z06 was delivered to France in a matter of a few days, and although not yet fitted the products look good. At this stage, and if the products perform well ( no doubt they will from reading reviews) , I'll be happy to use this company in the future....no messing about , which is exactly the service I need. Michael Fitted to m5 e60 .great feel in pedal with nice bite.much less dust. Keith Beagley Fitted perfectly good quality,will be ordering some more from you for my 08 Saab 9-5 Hot Aero. Hussain Didn't know black discs would scrape black paint off when used otherwise would of just got silver ones. Other then that havnt had any issues. Had rear ones fitted in got front to do, but i think they overpriced for front ones compare to any other make. So i opted for brembo instead. Neil Excellent service. Fantastic stopping power and look the business. Definitely value for money! Simon B Always had Greenstuff before on me Westfiled and other sport and kit-cars, but now more "senior" and sedate trasnport. My Volvo is now Ultimax on all four corners - superb product, great price and excellent service. Well done EBC. Flar Stunning Brake set for my Mazda 6 GH. Always is passion to take ride wit this brake set and enjoy it wit good music. Good work EBC and EBC Brake shop for delivery. Max Super fast delivery, fits perfectly and works great. Greg Very good brakes, can't recommend EBC brakes enough. Never had a problem with them. Way better stopping power than stock or equal brakes. Tomcat Parfait, seul e-marchand à avoir le bon disque pour ma voiture et que dire de la qualité du produit et de l'emballage. Parfait, je recommande. Ben Anthony Great product, super fast delivery and cheaper than anywhere else. Really pleased will 100% be a return customer. Anonymous These pads are awesome, they stop really well. The only downside is that they squeak for the first 150 miles ish but that is to be expected. Luciano For Honda Civic. Great stuff, easy to install, perfect fit, and good performance. I am really happy with my purchase. Jordan Amazing brakes. Pleasure to do late stop and my car glued to the road. Jose L. Ciordia We used these pads in our Golf Mkll at the 24H Experience at Portimao (Portugal) together with the turbo-grooved front discs and out of 30 cars on the grid, ours was the latest-by-far braking everywhere. Great performance from the first turn! Andy These have made a huge difference to my 2004 Jaguar X-Type. They fitted perfectly and although they aren't bedded in fully they show up how bad the previous owner let the brakes get. So the main plus points: They fit straight on with no faffing, they work really well before they are bedded in and they were delivered quickly. Very happy. David Duddy I have purchased these brakes a few cars back and for a car to stop better these were perfect which is why I decided to purchase better than standard brakes again. Anonymous Perfect quality and fast delivery to Germany! Thank you! Anonymous Easy to use and super fast service, excellent! Szymon Really fast delivery and well secured package. Parts are high quality and had no hassle with fitting them. I did only 50 miles so far so can't tell much about performance. Replacement disc brake fixings would be highly appreciated bonus. T Keilty Exceptional brake pads. Will always use EBC green stuff brake pads with EBC disc rotors in future. Big improvement in sharpness of brakes and very quiet. Martyn An excellent upgrade. Brakes do work better than standard but the most positive thing is the lack of brake dust. Alloys stay cleaner for a very long time. Also EBC are a great company to deal with. On a previous order I made a mistake which was very quickly sorted by the company. Can not praise the company nor their product enough. David Perfect ! 3 cessions track days, 2 times in Spa Francorchamps with my healthy car 260hp but 1650kg.(!) Brera v6 Q4 ... brakes very powerfull , no problem with high temperatures . Good surprise, in the daily use , no noise, just silence with brakes. For me, third times I buy EBC disk AND pads. Anonymous Using the brand for the last 10 years. Good quality, fast delivery. Highly recommended! Martyn I found EBC easy to deal with and good communication through out my stuff arrived on time. Being able to order brake kits made it easier when ordering. Will be recommending to friends and family. Thank you. Philippe Je deconseille fortement. Les redstuff sur disque normale font un boucant du diable. Plaquettes en ceramique selon mecano ce monte seulement sur disque ventilée voir perforez. Orestes Morales Very profesional service, and very good quality from the item.it has been a pleasure to deal with this Company, and I, will recommended to every body. OG.racing. We use the red stuff pads for circuit racing,we left the ordering late three days before Cadwell park,the reason being the other dealers websites where useless until we found ebcbrakeshop!we recieved the pads with in two days. These pads also fit MG midget . Healey sprite. Alan Atkinson Discs and pads arrived promptly but I was disappointed to find there was no Lubricant included with the pads. Based on other reviews which said the Lubricant was included, I was expecting it to be provided. I had to order the Lubricant separately and pay a second delivery charge. Dave Top notch pads,Excellent service. Many Thanks. Anonymous Excellent service. particularly liked the online advice/chat facility which helped with ordering the right item and also helped me avoid buying two pairs when I only needed one! brilliant. Alexander Work great on a Mazda CX-7 SUV; silent, not too hard and great grip. Alexander Got these for a Mazda CX-7 SUV which had warped original discs. EBC discs work great and protective coating is definitely a plus. Bernard Fesquet I have had no problems with my purchases. Good price, good delivery and great communication. Highly recommended. Bernard Fesquet First class product, highly compatible and easy to put. Jason Barrass Good quality discs much cheaper than the manufacturers costs and quick delivery. Staff very helpful. Attila Homalyos First class product.Good to look at. Erik Nice discs/rotors, finish on braking surface was nice. They were not painted, but I just painted the "hats" with hot-paint before installing. Dimitar Peltegov Good product; fast delivery; well packaged; brakes perform well; cheaper than original Fiat set. -Grinding noise until the protective black coating on the discs was scraped off; pads covered the wheels with a lot of red brake dust during bed-in period; too long bed-in period compared to other brands. Overall good value for money! Anonymous Fantastic heavy duty pads! I was able to improve significantly the braking of my SUV. Great value for the money! Mirco Rader Very good price, super fast delivery to Germany. (Took two days). You can't get a better price than this. Anonymous First of all, the delivery to Germany was superb. Sent from the UK Monday and arrived on wednesday. Price is great, you don't get it cheaper. This ain't gonna be my last purchase. Tarq Excellent service and top quality products. Have used EBC many times for all the cars in our houshold. Good prices and delivery is always absolutely on the button. QL Good advice from knowledgeable staff. A pity that delivery to the Highlands is rather more expensive, though perhaps a bit heavy for Royal Mail, which would have been cheaper. Steve Good quality. The old disks were stuck fast and wouldn't come off the hub. I used a large 3 jaw puller to put some tension on them, and a blowlamp to heat the old disk, and when they were hot enough they popped off. J Sindall Quality product delivered very fast at a competitive price. Very satisfied. Paulo Very good service. I hope deal with your company again. terry stevens i actually used ebc discs and pads on the front and rear on my skoda fabia 1.9tdi . and they match the original equipment.the other replacement pads i've had rattled in the caliper. but not these.so i would recommend ebc discs and pads. bb4dan After doing about 150 miles, these brakes are silent, initially squealed. Also drove and slammed brakes on five times, as if a cat ran out on the road on quiet location. Did a lot of research on ceramic brakes. Took a chance and it paid off. I must say the delivery was next day after the weekend with superb tracking. did not have to wait in all day. Emails from company too to say when my item will be dispatched and payment confirmation. Easy peasy purchase on their website. Registered and rang and spoke to the company too. Many thanks. Richard Webster Very swift dispatch, perfect fit did just what I wanted. Anonymous Used blue stuff before and wanted something with more bite power. Blue stuff on the race track was doing well but I wanted more from my stock size brakes. The only choice from EBC was the top of the range - Orange Stuff. It is my daily car and brakes bite well even they are cold or hot. No race track experience yet with Orange stuff but I hope I will be able to add review later. No any noise from brake system has not been observed with blue stuff or orange stuff in cold or hot state. Tifosi101 Far the best solution for Ferrari handbrake pads. Excellent quality part and fast shipping in EU ! 45bvtc The RS3 Forum well now I'm a strong advocate of EBC Redstuff brake pads as a road-going cure-all for the 8P Audi RS3, Redstuff providing low-speed squeal-free front brakes, low brake dust, and a hugely improved (over the 47i6 Audi upgrade) brake pedal. Well I have to tell you I am now a fan of EBC Greenstuff brake pads on our Audi A2 (90bhp TDi with discs front and rear), a huge improvement over the STD Audi pads; excellent pedal, superb feel, and ok a little more brake dust than Redstuff but a lot less than the STD Audi items. Well done EBC. Lee aitken Range rover supercharged takes some stopping... ultimax discs and yellow stuff pads stop it on a two penny bit! And look the biz too..
Mike, Hertfordshire EBC Greenstuff brake pads work! My Honda CR-V didn't have the greatest performing brakes and the standard pads felt like they were made of wood. I upgraded to the EBC Greenstuff pads and have them to be very effective. Braking distance was reduced and the feel through the pedel was much better. I don't use anything else now. Only downside is the cost of the pads and they don't last as long as the ineffective OEM pads. 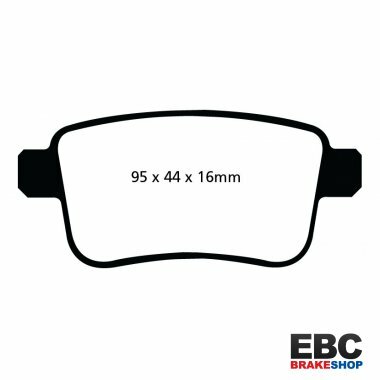 I buy the EBC pads on line EBCBrakeshop and have found the service excellent. Anonymous Good product. Great service. Anonymous Very quick service and excellent fit and great brakes.will purchase from again. Anonymous I cannot fault the service and customer support. Friendly and helpful. First class. Ruud K. Since I do not travel far distances anymore (hence far less motorway) I "downgraded" from red-stuffs to green-stuffs. I am so very glad I did... the red-stuffs did not get a chance to warm up, since I do not use my car that often (long distances). The greens are much better for my needs now. I can recommend anyone driving a car: buy EBC, it makes a world of difference (and actually make your car stop, in time). Peter E Excellent fast delivery. Couldn't ask for more, excellent products that i have used in the past for various vehicle which helped in picking EBC again. Pete Milne These are excellent pads and well worth the money. In fact, when you consider what a dealer charges for a simple brake job, you're much better off doing it yourself. The anti-squeal pad on the back is a useful addition and works well. They still produce brake dust but I wouldn't trust them if they didn't produce dust as it's a by-product of effective braking. Wayne Excellent service and would highly recommend! Delivered very quickly and very well packaged. Pads are now fitted to vehicle and already feel better than my standard set that were bedded in and half worn! Nigel. Bought with front pads and had 100% service, availability same day collection, James at EBC Brakeshop sorted out minor problem with card details and overall brilliant customer service plus the pads are working well with little dusting and plenty of stopping power. Great. Nigel EBC Brakeshop had them in stock when lots of other sites did not, they price matched and organised same day collection from their premises. 100% service. Absolutely fabulous. Would use them next time for sure and the pads seem to be performing well so far with little dusting and effective stopping power. cristian , italy verry fast shipping is take only 3 days to arrive me home , for performance must do test , right now i must do 200miles and have care with braking..
Aurelie M Amazing on my TT !! peter from belgium I fitted them together with the turbogroove discs. instand succes. My car is not slowing down anymore but is really stopping now. Peter from belgium directly after the discs are fitted, you feel a great difference. And it was raining. In dry conditions you feel de difference even better. They are fitted together with redstuff pads. Damien O'Brien Excellent Product. Perfect Fitment for my E200K Sport Excellent pedal feel with Yellow Stuff pads. Rowan Super fast delivery required and got. They are excellent pads. Pity the wear on my car isnt even as I would have probably got another 3ooo miles out of the old ones. They are a little expensive for my taste but ask yourself, how much is my and passengers lives worth? joey driver delivery service is excellent. pads work great and have less dust. way better than standard pads on honda civic. car stops really good now. Anonymous Fast delivery, better quality than original, easy installation. Stronger breaking than original. Anonymous Fast delivery, better quality than original, easy installation. Stronger breaking than original with same green stuffs installed. Ray Roberts I have a classic car and sometimes am supplied with bits that don't fit. I am glad to say that with EBC it was easy to order the parts were delivered promptly and fitted perfectly. 100% happy! Anonymous Ordered these along with Ultimax pads and was very impressed with the delivery and quality of the product. Absolutely perfect fit making it a very easy job to complete . As for the performance .....well as it said in the description super quiet and great stopping power again. Would recommend the added expense to standard discs/pads. Willy Used in Subaru Impreza 2.0D great differences compared with standard disc in performance and look. Ian Scholey Service has been excellent. James in sales has been very helpful indeed.Will definitely buy again. Tony Griffiths Excellent service first class brakes whould higly recommend this product and company to anyone. Pepster A great upgrade, they take a while to bed in with the red stuff pads but they are just what you need when you come across a mobile speed camera !!!! Keith I fitted the Yellow stuff pads to my civic Type R and they are so much more responsive than the originals. Work from cold which is a bonus. Anonymous Used on my e39 M5 for road and track use (Nurburgring). Fine from cold on the road, fine on the track. Alexander Wooldridge Smith For a track use pad these are very good for general road use, with more initial bite than standard BMW pads and much more brake power. They will even trigger the ABS on slicks. They are happy from the first application on a cold day at 20mph through to repeated 120 mph stops for 30 laps on trackdays, so very fade resistant. The only minus point over normal pads is the occasional very slight squeak at low speed. My pad of choice from now on. Mike Valentine Excellent product, fast delivery! With uprated pads these standard discs are just fine for standard power, or slightly tweaked. Anonymous Early days but signs are very good. Paired with Yellowstuff pads, the initial bite is strong but progressive, even when cool. When warm, feel is greatly imroved over o/e items, and stopping power is immense when needed. Anonymous Thank you! Great Pads and fast shipping! Will buy your products any time again! Anonymous Best quality, my brakes definitely feel better now. Good service and very fast chipping to Belgium thanks. Anonymous The Honda Accord EBC turbo grooved discs are ONLY FOR 300MM discs. I have 280mm front discs on my accord and EBC dont make them. Tammy Morgan Give a very smooth ride, and they look really good fgrom the ourtside. We aim for Goodridge brake lines to be on a next working day delivery, however with such a big range sometimes they are built to order. In this case delivery is 5 – 7 working days. If you would like to know stock levels on any of our products please email sales@ebcbrakeshop.co.uk or call 01604 212 140. Delivery to mainland UK on all orders is free! If the delivery date is to be any longer than this time you will be contacted by one of the EBC Brake Shop sales representatives. All orders will be shipped by recognised carriers or the Royal Mail. EBC Brake Shop is not responsible for any additional costs as a result of extended delivery times, unless prior consent is given in writing by a member of EBC Brake Shop staff. Where an order is placed from a country outside of the European Community, we will require a international bank transfer to a nominated account before we can ship any goods. For orders outside of the UK, place the order and we will contact you regarding delivery of the goods and the costs for your country. No money will be taken from the credit card until you have accepted any additional costs for overseas shipping. In the event that there is a problem with the goods, please contact us. For unwanted goods, we accept returns for up to 365 days, so long the items have not been fitted to a vehicle or used under any circumstance. EBC Brake Shop is not responsible for any additional costs as a result of a faulty product, unless prior consent is given in writing. Products must be returned at your cost and in re-sale able condition.